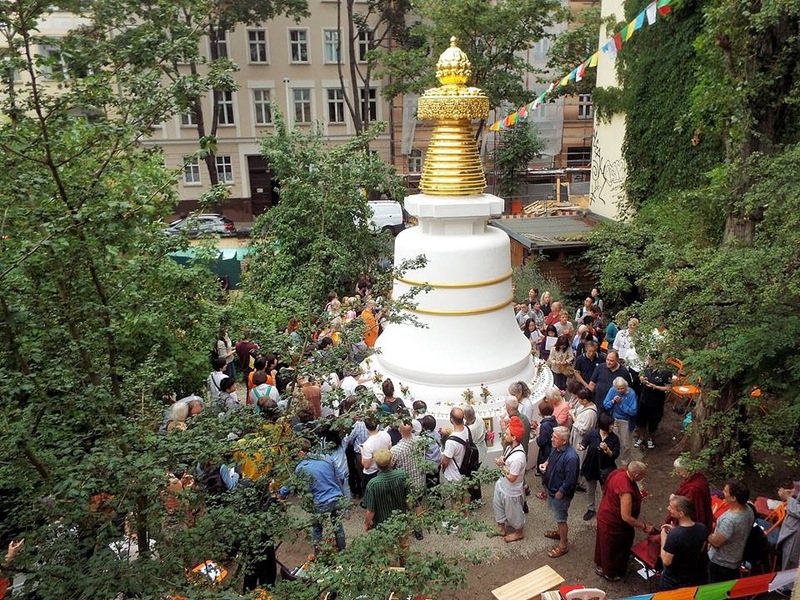 The idea to build a Stupa at Kinzigstraße 25 – 29 in Berlin-Friedrichshain goes back to the year 2003, when Bodhicharya purchased the premises and made plans to develop the derelict place into a Buddhist center. A small group of people soon started with preparations. His Holiness the 17th Karmapa suggested to build a Kadam Stupa, which is bell shaped. Lama Phuntsok and Khenpo Karma Namgyal gave continuous advice regarding which prayers, substances and items to prepare and collect for the filling of the Stupa. 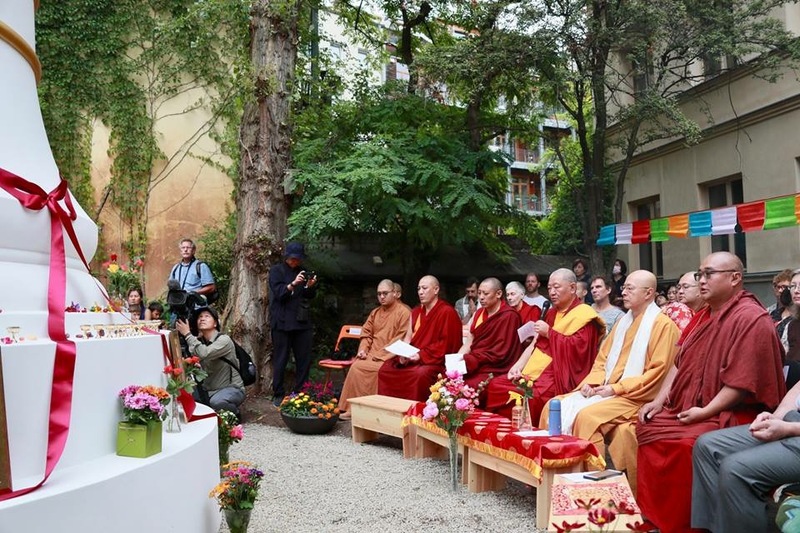 In 2014, during his first visit to the center, HH Karmapa laid the foundation stone. With the help of many sponsors it was possible to start the building process, combining Eastern experience with Western craftsmanship. 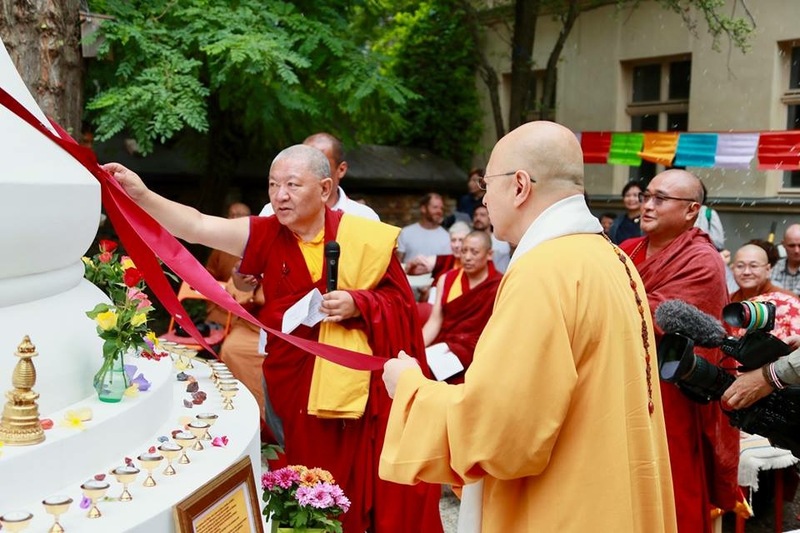 Ringu Tulku Rinpoche will give three evening teachings in Bodhicharya Berlin (25-27 July) on the topic “Stupa and Dharma Practice; How to use stupa and other sacred objects to work on our development“. For more information and pictures of the stupa see: https://facebook.com/StupaBerlin/ and https://stupa-berlin.de/english/. Photos Winfrid Liebrich, Anja Bene and others.